There was an update in PLDT’s Home Fibr router console page wherein the super-admin account “adminpldt” has been disabled. That caused the end-users lost their access to the other features in the router’s console page such as the Security and Application tabs. In this tutorial, I’ll discuss in simple easy steps how you can re-gain access to the console page with full privileges. So, let’s get it started. Open you web browser (Chrome, Opera), type in http://192.168.1.1/login.html and press Enter. On the login page, enter the credentials (Username and Password) and click the Login button. If logged in successfully, you’ll be redirected to the default view which is the “Device Information” page. Now, press Ctrl+Shift+I on your keyboard or right-click on any part of the page and select “Inspect“. This should open the Developer Tool panel where we need to apply the tricks. In the Developer Tool Panel, click the Sources Tab. You will see in the Developer Tool’s left pane the list of resource directories and files. Now, locate the file called “menu_pldt.asp“, others may just be “menu.asp” only. Take note of the hierarchy where the file is located above so you can find it easily on your end. 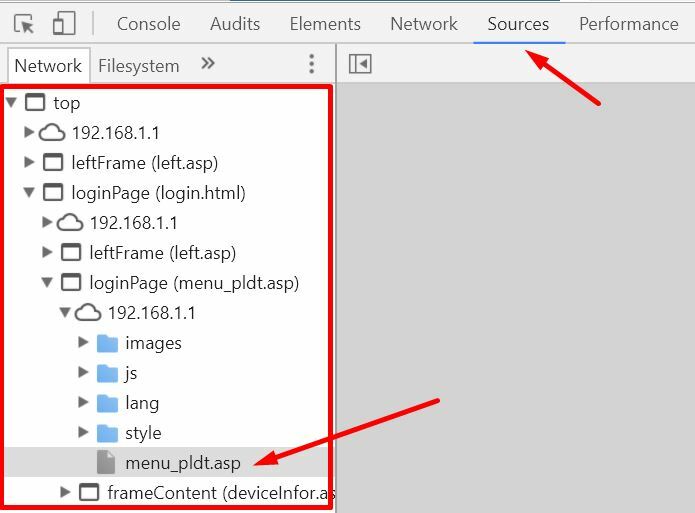 Select the “menu_pldt.asp” file to view its source code. Search for the variable named “curUserType“, just to make sure that you’ve open the correct file. In my case, it’s on Line 23 as highlighted above. Now, click the Line number of the next variable after curUserType to set a breakpoint in code execution. In my case, it’s on Line 25 as pointed by the arrow above. The breakpoint will allow us to alter the values of the previously declared variables. In the Console tab, type curUserType=2 and press Enter. Finally, click that play button or press F8 to resume script execution. You should now be able to see the Security and Application tabs. You can now take full control of your router whether to allow, block or limit devices from accessing the internet. The above method seems to do not work anymore maybe due to automated firmware updates on your PLDT Home Fibr routers. But don’t worry I have figured out a solution so you can access your PLDT Home Fibr Advance settings console even using only the default “admin” account. Hindi ko po maapply yung procedures nyo sir kc tab lng po gmit ko. Mtulungan nyo po sana ako asap. MODEL: AN5506-04-F VERSION: RP2658 ito yung lumalabas sa akin sir!.. help me please!/..
b28n.js:101 Synchronous XMLHttpRequest on the main thread is deprecated because of its detrimental effects to the end user's experience. For more help, check https://xhr.spec.whatwg.org/. b28n.js:101 [Deprecation] Synchronous XMLHttpRequest on the main thread is deprecated because of its detrimental effects to the end user's experience. For more help, check https://xhr.spec.whatwg.org/. Thanks for bringing this up. I've also had that same error like yours so I've updated this post to reflect such changes. Ang problema ay dahil sa restrictions na ginawa ng PLDT sa pamamagitan ng automatic firmware update. Dahil dyan may ginawa akong isang tool kung saan pwede mo ma-access ang iyong advance settings ng iyong PLDT Home Fibr router kahit gamit lang ang "admin" na account.